I was recently asked to become a Grandmaker at a Grandfest festival which was held at St. Fagans on Sunday the 9th July. 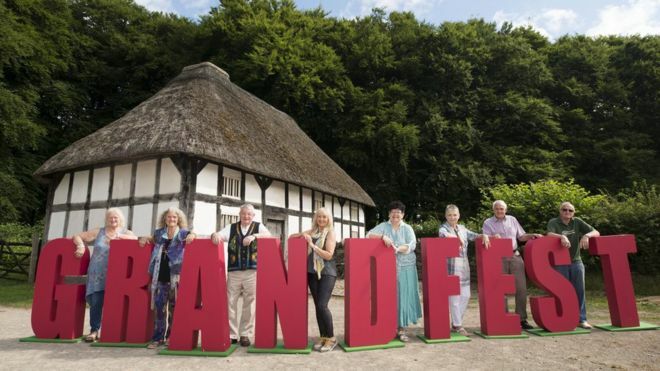 Grandfest is a festival organised by the Royal Voluntary Service (RVS) which celebrates the skills of older people. In the festival, Grandmakers, older people over the age of 70, pass on the skills they have learned and perfected to younger generations. I agreed to take part because I have always been a strong believer that learning isn’t just about courses, exams, qualifications or work. Learning is about Sharing, Socialising and having fun. It is not just for the young or people of working age but for people of all ages. There is an old saying that “you are never to old to learn”. In fact the older you are the more important learning becomes. Give to others – even the smallest act can count, whether it's a smile, a thank you or a kind word. By taking part I was able to fulfil these 5 ways. I connected. I had a wonderful time talking to children who think that learning a new skill is an adventure. I met a lady from Spain who makes the bobbin lace that British tourists buy on holiday. She was fascinated with my tatted lace. We could have talked all day. My hobbies and activities keep me active so my body is reasonably fit but it is the keep learning that keeps my mind active and allows me to overcome the depression I feel sometimes. I would lump give to others and Be Mindful together. The feeling I get when I am able to pass on a skill or a technique I have learned is fantastic. One lady and her daughter wanted to learn how to do tatting as she had possessed a tatting shuttle for years, but did not know what to do with it. You never know her daughter my take it up and so it could pass down through the generations. The Royal Voluntary Service wants to help create a society where everyone feels valued and involved whatever their age. The RVS is also a supporter of Men’s Sheds. Why don’t you pass on our skills or take up a new skill so that you can pass them on to other people, to stop those skills from being lost. It could also help with your physical and mental well being.